Sandakan is a beautiful exotic, culturally diverse community located in the city of Sabah, Malaysia. It is the second biggest city in Sabah and is home to a myriad wildlife and natural attractions to the visiting tourist. Visitors to Sandakan have a variety of options, from cave exploration to bird watching to golfing, here are some great places to visit and things to do in Sandakan, Malaysia. For animal lovers, this will prove a nostalgic experience. 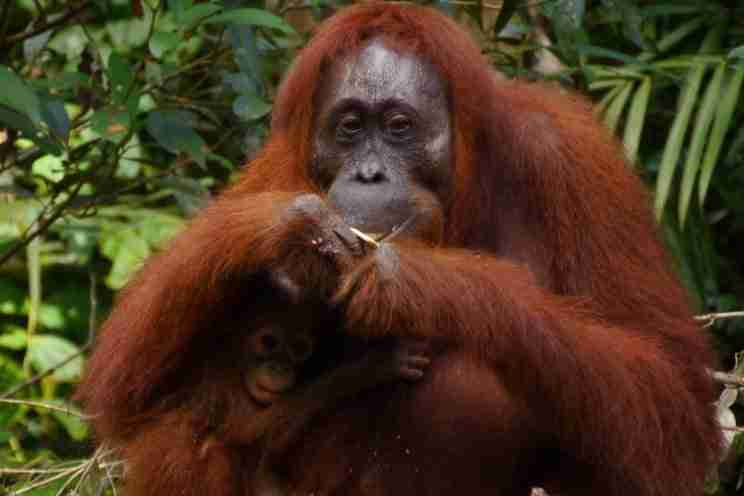 This rehabilitation center consists of 43 square miles of forestry, teeming with protected orangutans. This retreat caters to the needs of protected apes by providing them with food, healthcare and a safe place to survive the perils of deforestation. It is also home to other species like bears, rhinos and elephants. Escorted by experienced tour guides, visitors have a range of options to indulge in during their visit. They can watch the animals at play from protected platforms. They can also trek through various trails, swamps and highland forestry, and be enthralled by the magic of Borneo’s wildlife as they go! This place is a natural reserve in the forestry of Sandakan. It has many thrilling activities on offer. One of them is a breathtaking boat ride through towering trees and bushy undergrowth. Birdwatchers will love the variety of birdlife that appear at seasons during the year. 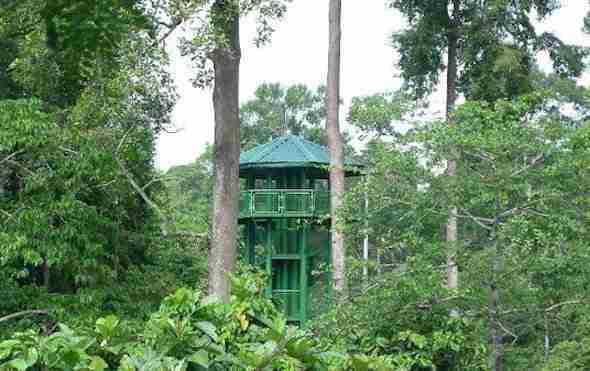 It has many plants and shrubbery exhibits that enrich one’s knowledge of the plant life typical to Borneo’s wild. The best way to understand the culture of a place is to observe its people! The best way to understand a people’s lifestyles is to buy what they buy. Sandakan central market offers both these experiences. It is a popular eatery and shopping mall, thronged with people throughout the day. Its visitors comprise a rich cultural mix of the ethnicities common to Sandakan, from Chinese to Malay, to Filipino to Indonesian. A visit to this market offers a great outlet for people watching and to taste the best cuisine of Sandakan. Sandakan is home to many great golf resorts. These are not just about golfing, but the ultimate test of skill! Sandakan’s mountainous vigorous terrain literarily offers leaps and bounds in golfing courses, for the ardent golfer to test his mettle. From curving terrains to deep indents and jungle undergrowth all the way, golfing in Sandakan is a fun filled activity. From beach based golf courses to jungle based courses, they are all on offer in Sandakan. Although a house might seem an unusual tourist attraction, this house is no ordinary house. 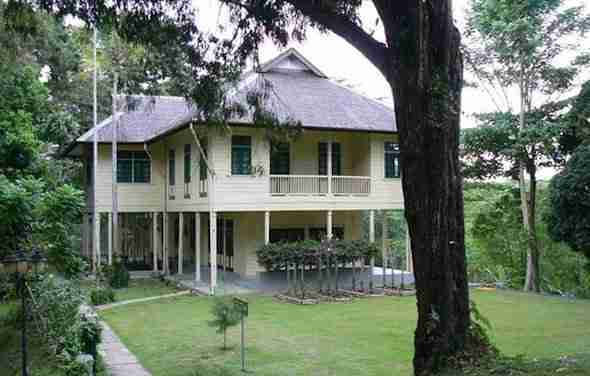 It is a home that dates back into the colonial era. It was owned by the Keith family, who were wildlife enthusiasts. They lived in this house during WW (II). Stepping into this house, one is thrown back in time to a different era! Its interior is perfectly preserved, with colonial furniture and even wartime artifacts decorating the floors and walls. A visit to this home provides an insight into the life and times of bygone days. 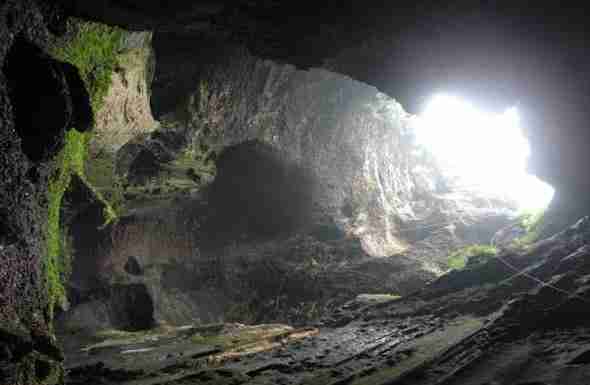 Gomantong cave is famous for its high walls and ceiling and millions of bats. It can be both a chilling and a thrilling experience to explore this dark, century old cave. Upon entering its murky confines, one is immediately cast into a scene of gloom and doom. Huge caverns rear up hundreds of feet into the air. Their apex is shared by millions of birds and bats, who flutter about incessantly. The bird nests are a popular treat for man and insect alike. Sometimes locals steal these nests to make bird nest soup out of them, a popular local delicacy. The cockroaches, and termites lining the huge walls at all times, are making a beeline for the nests, too. A bird and insect sanctuary, or a chilling cave scene from a medieval fairy tale! This wildlife conservation park is home to thousands of sea turtles. These creatures are an endangered species. 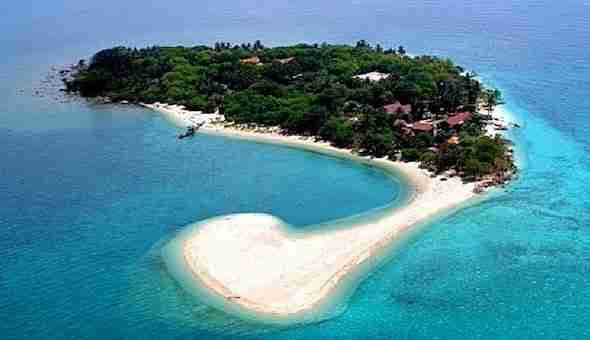 Visiting this island can be a fulfilling experience. The turtles make their first appearance at dawn, and vanish by night. One gets to watch many fascinating things from turtles laying eggs, to young hatchlings taking their first dive in the open sea. There are also boat trips available from the mainland to the island. The island is a beautiful place and home too many trees and shrubbery. Once there, one can also trek through this it with the help of a tour guide or opt for an overnight stay in one of its island resorts. This visit is sure to prove a restful experience away from the hustle and bustle of other wonders in Sandakan. Situated in the highlands it is home to with many fascinating, ornate idols. A view from the interior gives you a glamorous panorama of the deep blue Sulu Sea and the surrounding city. 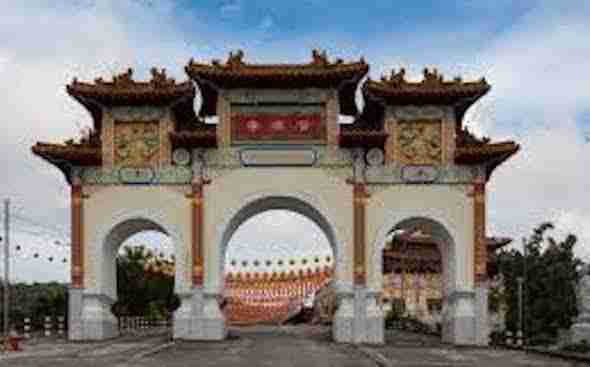 It is also a great place to learn about the culture and history of Buddhism in Malaysia. A must see for the spiritually inclined. Visiting this memorial ground is a melodramatic yet educational experience. It takes visitors back to the bad old days of the second world war, when hundreds of prisoners were tortured to death in concentration camps in that location. 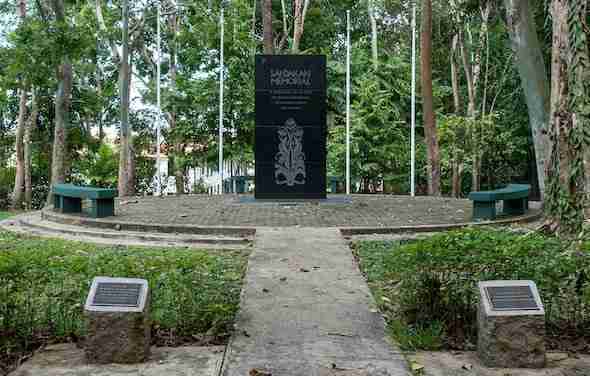 This place was notorious for the death marches that prisoners of war were made to undergo. During the visit, tourist guides explain much of the history and tragedies associated with this place. It still preserves memorabilia from the time, including photographs, survivor stories, and even physical artefacts like a boiler and a water tank from that era. Sandakan has a good variety of guest houses, hostels and hotels. Here are a few places to check out and give you an idea of what is available in Sandakan if you are planning to visit Sandakan Malaysia. Sandakan Backpackers Hostel is situated in Sandakan and offers air-conditioned accommodation with free WiFi, as well as access to a terrace. The property overlooks the Sandakan Bay and Sulu Sea, with free WiFi is accessible throughout.Every room is appointed with a flat-screen satellite TV and tea/coffee making facilities. The en suite bathroom comes with a shower, a hairdryer and free toiletries. Finally, in many ways, Sandakan is a cross section of the cultural, historical and natural beauty of Borneo. A visit to Sandakan is an all-encompassing experience. There is no limit to the diversity of tourist attractions on offer. From visiting wildlife sanctuaries to playing Pro golf, to cave exploration, there is no end of things to do in Sandakan! On the melodramatic side, this city also has a sadder side to its history, centering on its associations with WW (II). It also has a rich backdrop in the colonial times. Today, memorabilia of its history are on exhibit to the public. 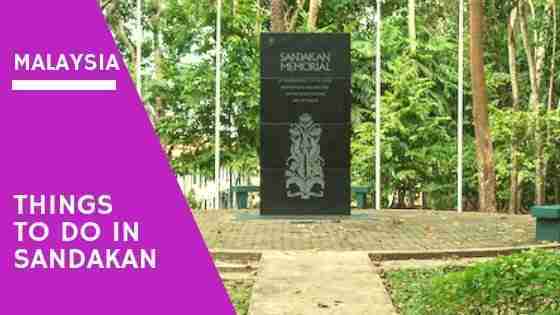 Both sides of the Sandakan coin provide rich experiences to the visiting tourist. All tourist attractions can all be accessed via bus or taxi from Sandakan city. Most of them come with guided tours for both instructive and inspiring adventures. And that’s it for now! 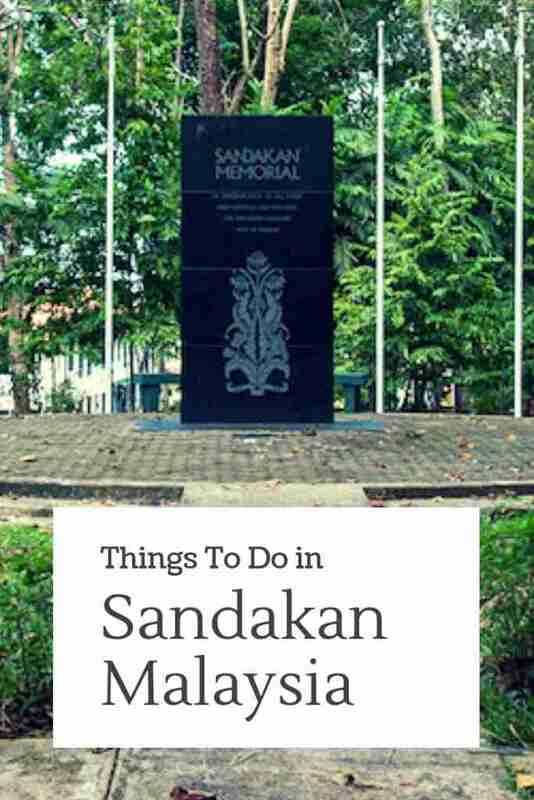 I’d love to know if this post on the things to do in Sandakan Malaysia was helpful to you. Let me know if you have any questions and let me know if you go.